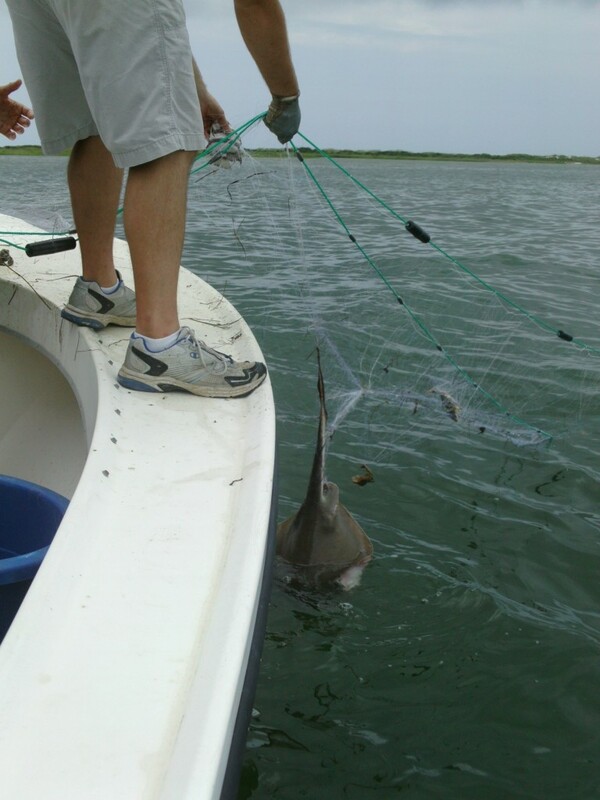 Summer of the Shark: Hatteras Blues – Ya Like Dags? Field work season has officially begun. On Wednesday and Thursday I set out for Hatteras and Ocracoke with labmate Evan and his brother Austin to test the gear, get an idea of how much sampling can happen in a day, and maybe even catch some sharks. This area was chosen because it likely has the most potentially difficult sampling conditions in the entire survey and also the best chance to catch some actual sharks, which would allow me to troubleshoot the gear and methods. Little did I know just how much troubleshooting would occur. Though the Cape Hatteras/Ocracoke Island area is an ideal place to chase sharks in pretty much every possible water condition, it’s also ridiculously far from ECU. We left Greenville at 5 a.m. and launched the boat from the Ocracoke public ramp… just before 11. Yikes. Between the long drive and the necessary ferry ride from Hatteras, it took almost 6 hours to get out on the water. For perspective, it takes a little less time than that to get to D.C. from Greenville. Right off the bat, we can note two important things: 1.) North Carolina is too damn big, and 2.) the only major NC university that totally lacks a marine lab needs one. Badly. Transiting from Hatteras to Ocracoke as part of the obnoxiously long travel time. Nothing like waking up at 3:30 to get on the water just before lunchtime. At least the ferry ride was quite nice. 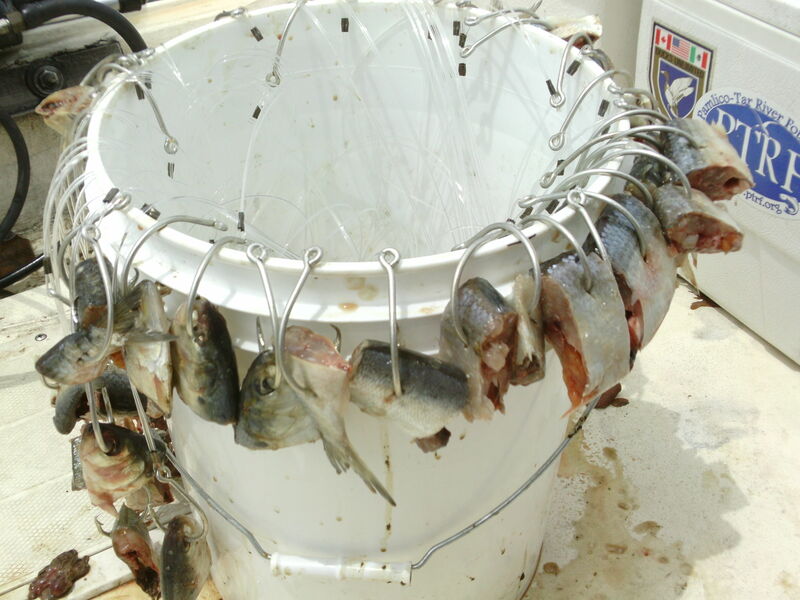 Our delicious menhaden bait. These fish smell a lot better to sharks than they do to us. It’s important to note that once we finally got on the water, our field work began with a couple bad omens. First, a seagull pooped on my head. Yes, that actually happens, and it happened to me. I saw some gull poop fly right over my left shoulder and hit the deck, breathed a sigh of relief. I then checked the back of my head to find, to my horror, that it had been a grazing hit rather than a near miss. This field day had begun with a seagull. Pooping. On my head. After thoroughly splashing my head with salt water, we found that the hooks had gotten all tangled up while we had been traveling, and it would be hopeless to get them untangled in time to make a decent longline deployment. So we opted for the gillnet instead. 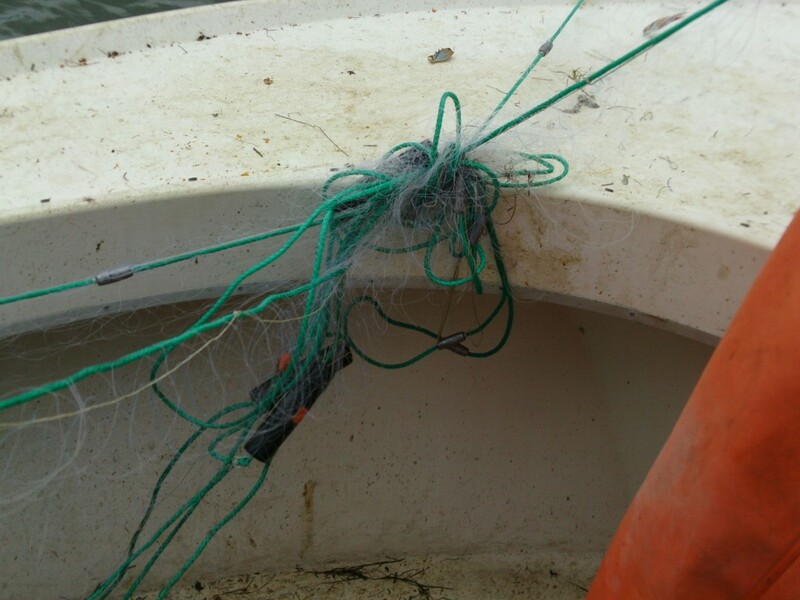 Despite the lack of a gillnet bar on the front of our boat, the net played out pretty well from the trashcan it was stored in. 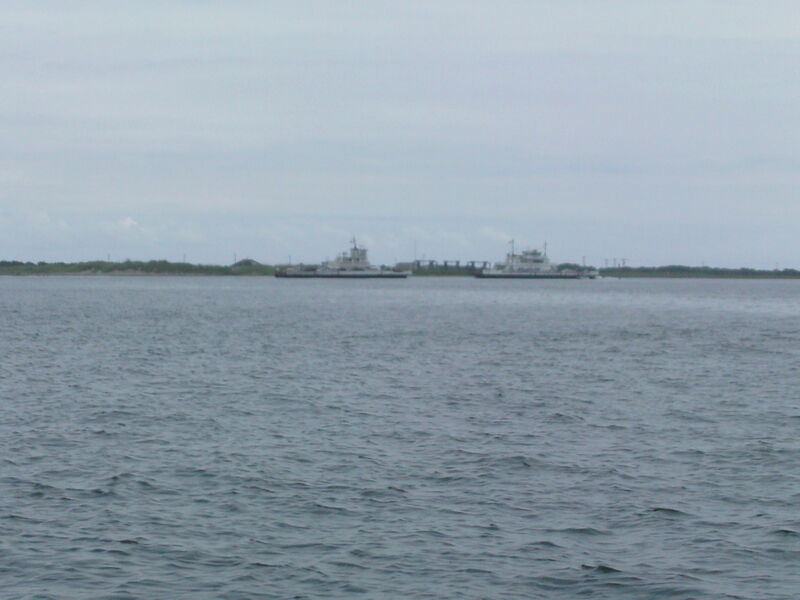 The water was relatively calm, and traffic was low, so we deployed parallel to the southern edge of Ocracoke Inlet, right at the drop-off of the shoal. Direct ocean connection, fast flow, sudden drop-off, should be a sharky area, right? Action shot! With the tossing of the buoy, gillnet deployment begins. Yes, I wear that shirt in the field a lot. 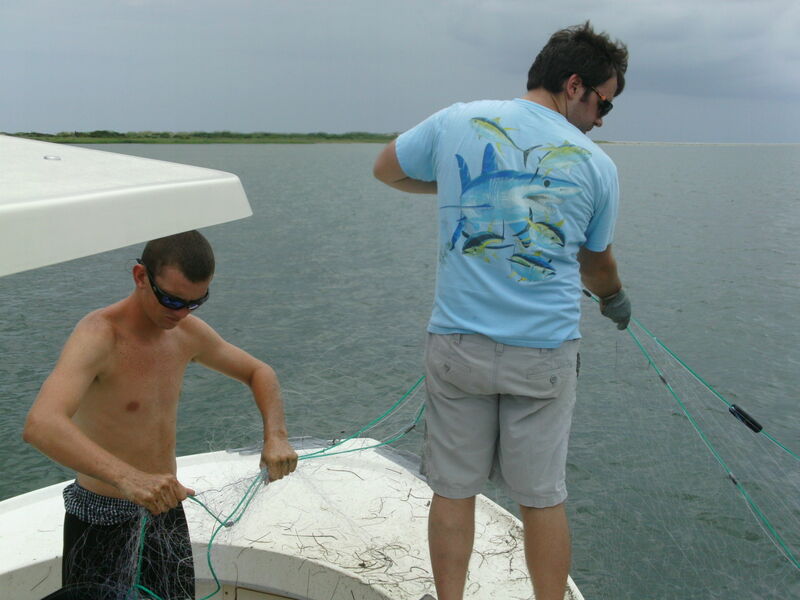 After taking lunch and disentangling some of the longline hooks, we started to haul the gillnet back. That’s were things got interesting. It turns out that the absolute bane of gillnetting is the delicious blue crab. Crabs were distributed with almost perfect spacing in the net, and individuals smaller than the palm of my hand were capable of bunching up the entire 10-foot height of the net into a six inch bundle with the crab in the center. Even better, it turned out that we had managed to leave the gillnet picks in the truck before we left. I wish I had someone to blame, but ultimately it’s my fault for not making sure we had everything before casting off. A few sliced-up hands later, we decided that we would need to leave some of the more thoroughly-snared crabs in the net until the next deployment. So far, so good? Shirtless field work time. Austin and I working up the gillnet. One of likely nearly a hundred crabs that came up in the first gillnet set. Remember that this was only a half-hour soak. A bluntnose stingray, officially the first elasmobranch of the field season. 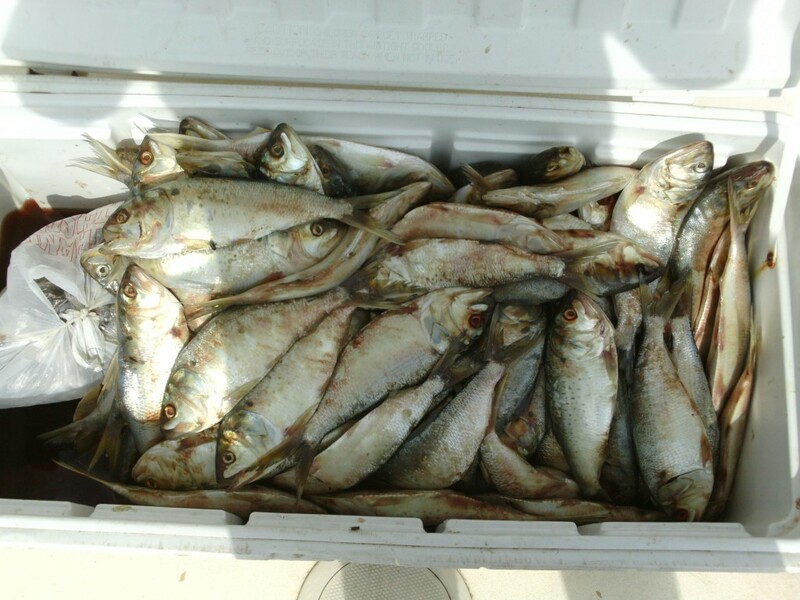 We did manage to catch a couple critters that were not blue crabs. A spadefish (the mascot of North Carolina Aquariums) made an appearance (they have pretty sharp dorsal fins, I might add). In a more positive sign for the project, an elasmobranch also showed up to the party. A bluntnose stingray was snagged by its tail. We were able to get it close enough for a species ID, but it managed to pull itself out of the net before we could land and measure it. As we were spending way too much time working through the gillnet, a pair of kids waded towards us on the nearby sandbar. At first we thought they were just curious about what we were up to (and probably lucky that we weren’t able to get the baited longline in, since it would have been only about ten feet from where they were standing). It turned out that their family’s boat was having engine trouble and they were wondering if we could give them a tow in. Being good folks (and already planning to head back to the dock to pick up those gillnet picks) we towed them back to the public launch. 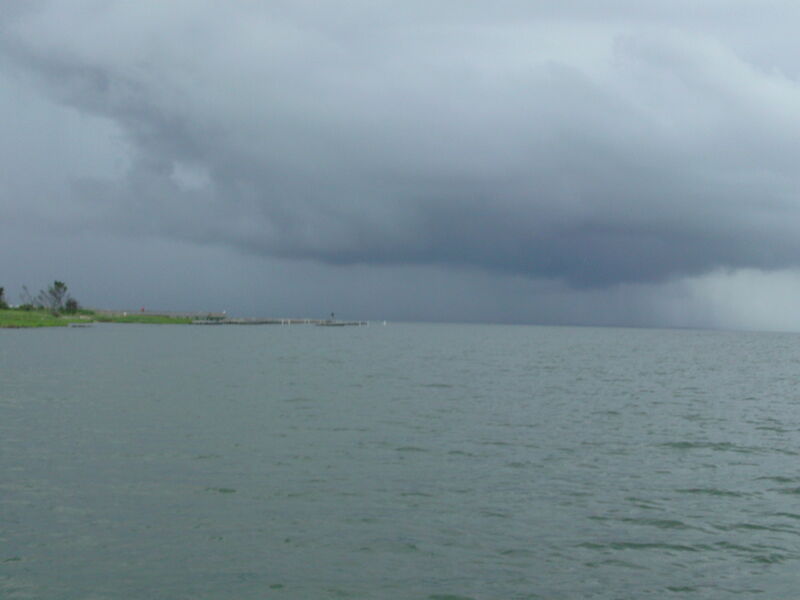 Unfortunately, as we looked behind our boats we saw some of that famously rough Cape Hatteras weather sneaking up. Working in rain can be miserable, but lightning is a whole other story. After a quick commiseration, we agreed to pull into Ocracoke Harbor and hopefully find a spot to tie off and somewhere dry to wait this mess out. Fortunately, either the owner or a manager (he seemed to be in charge, anyway) of the Jolly Roger Pub and Marina spotted us and let us tie off behind their place. When we told him we were after sharks, he told us about a six-foot bull shark a local fisherman had pulled up that had been bitten in half by an even larger shark. This had happened maybe a day or two before we got there. We got the approximate location from him and vowed to check the spot when/if the storm cleared. It took about an hour and a half for the weather to clear up to the point of being able to get back out, but at least we had some decent nachos and hummus dip. We returned to the same spot where we had set the gillnet to try and cover the same area with the longline. We had successfully worked 29 of the 50 hooks out of the snag, and the longline deployment and retrieval was like a vacation after working the gillnet. Unfortunately, the storm had done nothing to clear out the crabs and all we hauled back were totally clean hooks. Though the water had gotten totally flat calm after the storm, it was now starting to get a little rough. Determined to get at least two stations around Ocracoke Inlet done, we traveled around behind some of the shoals on the backside of the island. 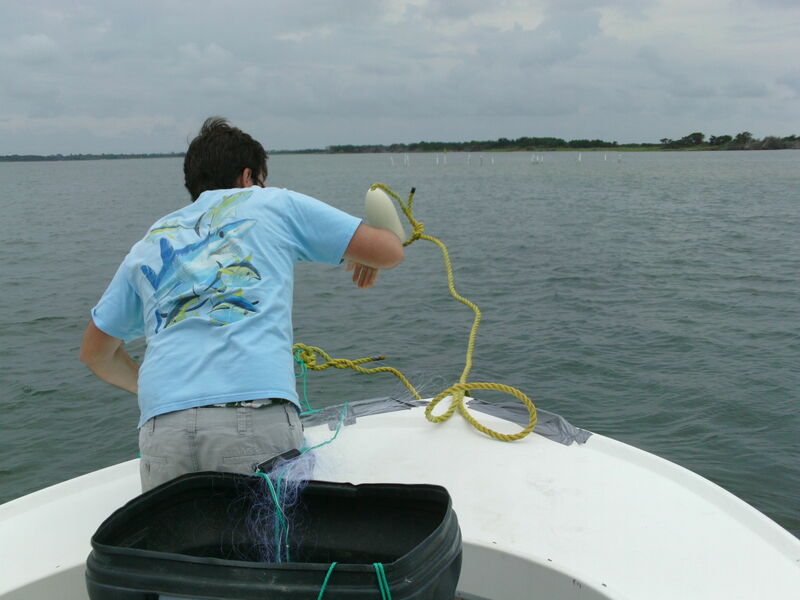 It was too rough to deploy the gillnet, but we took a chance on the longline. Sure enough, something took one of the hooks seconds after it hit the water. As I was attaching the next leader, I felt a hard tug on the line, way harder than the current or the movement of the boat. Then a black, pointed snout raised out of the water mere yards from the bow. After some loud cheering from us, it took all the discipline we had to deploy the rest of the line and allow it the full half hour soak time. It’s pretty thrilling to get a big fish on a rod, but it pales in comparison to handlining something that could very well be a shark. If nothing else, hand-longlining is an adrenaline rush. As our catch rose to the surface, we saw its dark body swirling around the leader, with the occasional glimpse of a dorsal fin. It was exactly the right size to be a juvenile of any of the local shark species. 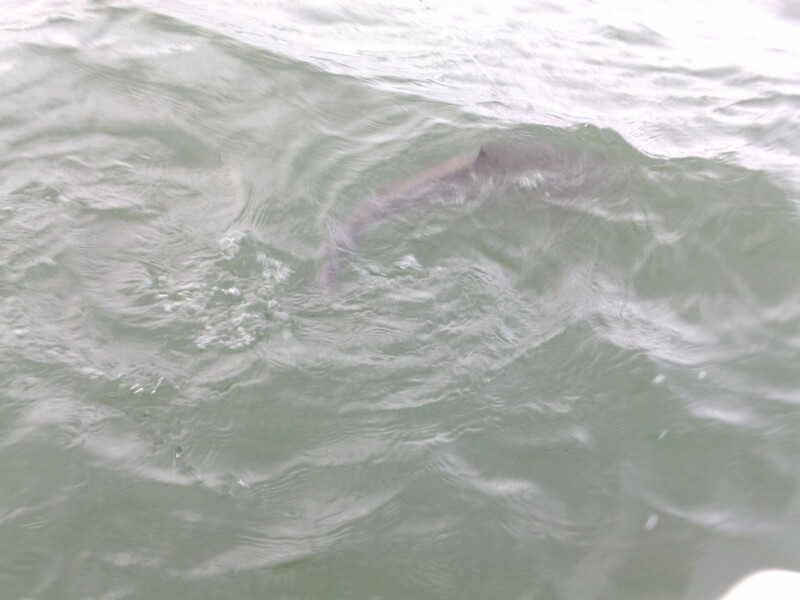 After everything Ocracoke Inlet had put us through, could this be the first shark of the season? I know that I’m in the right field because that moment when the fish finally comes to the surface is like Christmas morning every time. You don’t always get exactly what you want for Christmas. That’s a cobia, not a shark. Our “shark” turned out to be a 37-inch cobia (a species that is commonly confused with sharks when seen at the surface). An impressive beast, and very good eating, but not what we were after. 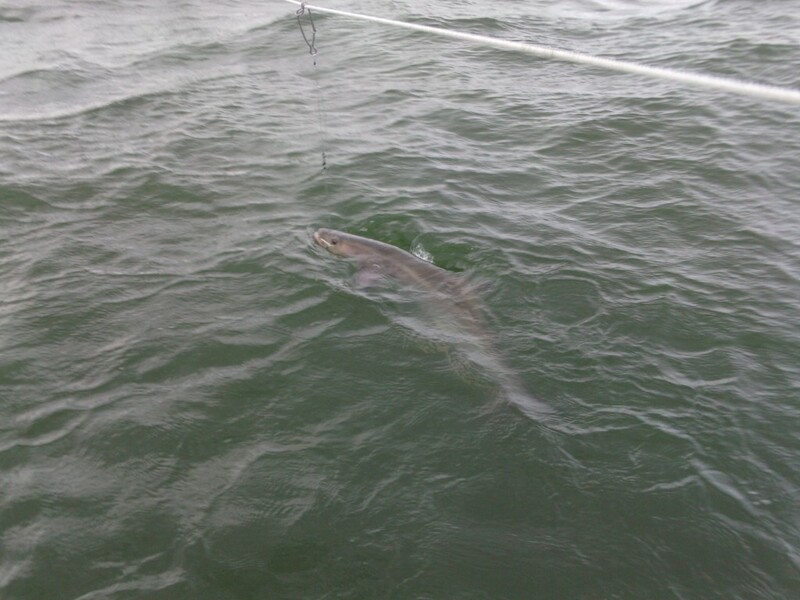 Still, it was a good test of the gear, since a cobia is very close to a juvenile shark in terms of size and fight. So no shark, but now I had a good idea of what our target-sized sharks should feel like on the line. With the sun going down, we headed back in, took the ferry back to Hatteras, and stayed the night at Frisco campground. Though we set up the tent at night, the next morning would reveal just how nice a place this campground was (and it costs about 1/5 of the cheapest hotel in the area during the summer). Crucially, it has showers. We got ready to sample Hatteras Inlet and maybe some areas behind the elbow of Cape Hatteras, and spirits were high. 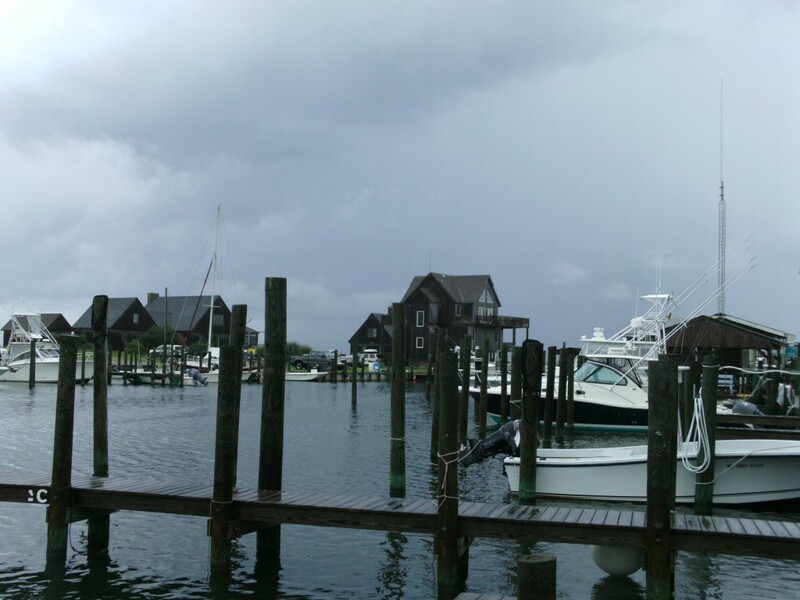 After all, the weather had to cooperate more than it had in Ocracoke, right? Our sampling around Hatteras Inlet showcased some of the most random weather I have ever seen anywhere, and I’ve lived in New England and eastern North Carolina. The weather kept switching, with no apparent pattern, between ferocious downpours and blazing, 90-degree sun. After the second round of this I just gave up entirely on foul weather gear, since I could just dry off during the next period of extreme heat. The water was flat calm in the inlet, but almost too rough to work in behind the island. The wind and swells completely changed direction at least twice. This wasn’t weather, it was chaos. But it wasn’t quite bad enough to chase us off the water and we had spent a lot of time and grant money just getting there, so we pressed on. We finally got a second gillnet set in, and successfully freed all the crabs (and yes, all of the little bastards were still very much alive and angry), but about 3/4 of the way down the net we found that somehow one of the crabs (a small one, at that) had managed to turn the net into some kind of modern art masterpiece. I can’t even describe the knot this thing had made, just that it had somehow incorporated both the float and sinkline and almost managed to involve the anchor line. 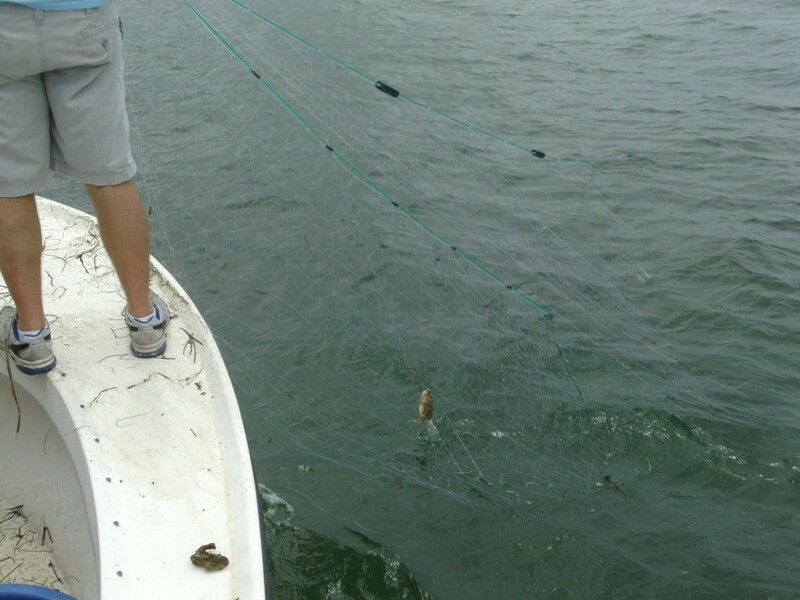 Upon this discovery, we just hauled back the rest of the net and packed it up for the day. We did manage to pick up a few new crabs, another spadefish, and some silver perch. One crab did this. One. Words alone cannot describe this knot, or the rage I will now forever feel every time a crab comes up in this net. The rest of the day consisted of longline sets. We didn’t get any bites behind the island, so we moved to a place that looked promising on the chart (but may or may not still be there due to Hatteras Inlet’s constantly shifting channels). It was a deep hole in the middle of a patch of high sandbar, and even offered killer views of the Ocracoke ferry dock. The sheer number of fishing boats we saw in the area suggested that it was normally a productive area. The place just looked sharky. This would be our last stand for this field trip. 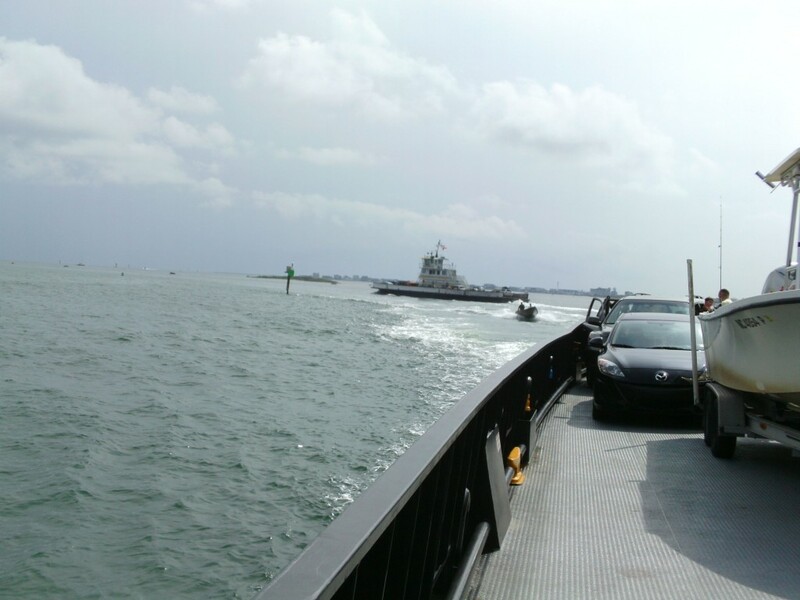 Ferries taking people to and from Ocracoke. These boats are the only access to the island. Spoiler alert: we caught nothing. Even as the tide shifted and started coming in fast, no sharks, or any large fish at all, were to be found. This field trip ended like many of my personal fishing trips do, with me getting skunked. On the bright side, we learned quite a bit about the gear, the weather, and sampling in general. For one thing, we learned that it’s absolutely essential to be versatile in the weather, especially around Hatteras. There is absolutely no point in factoring whether there’s a “chance of thunderstorms” around Hatteras because there is literally always a chance of thunderstorms in Hatteras (seriously, check the forecast for Hatteras, NC right now. I bet it says “chance of thunderstorms” every day for however long you extend it out). This particular field area is way too far out to cancel for anything less than a hurricane, since travel time and availability of boats and/or people will be much more important considerations. Plus, as the second day taught me, weather forecasts mean absolutely nothing around Hatteras. The crabs were really the only major problem with the gillnet. There are some issues getting it deployed and retrieved quickly enough to be able to deploy both gears simultaneously, but the main problem is picking all those damn crabs out and the damage they do on along the way. We may have to try setting perpendicular to the drop-offs where we can, with the hope that crabs will be less likely to venture out into the deep water to get snagged. Otherwise it may come down to us having to cut the gillnet size down to make it quicker to pick. The longline, on the other hand, was very easy (aside from the leaders getting tangled at the beginning of the trip). We have a system now that keeps the leaders from getting too entangled, and with that in place we were able to deploy the line in as little as 5 minutes by the end of the second day. As for the lack of sharks, my theory is that we hit the tide at the wrong time. Even around the inlets, the tide must play a big role in the presence/absence of sharks. The salinity was curiously low for much of the time we were out, and high tide didn’t start until about 3-4 in the afternoon, when we were putting out our last sets of the day. While it’s almost impossible to plan for weather around Hatteras, we can try to get more sampling on the incoming and full high tide. Of course, the ludicrous weather may have also played a role. So no sharks, and many technical difficulties, but that’s what pilot studies like this are for. We will be back out there before the end of the summer, once we’ve got the gear deployment down to an art (we are already very close with the longline). In the meantime, we have many more sites to check. Next tentative stop: a place where sharks are likely to be rare, but where they may be monsters. Pingback: Summer of the Shark: Best Red Drum Survey Ever | Ya Like Dags?